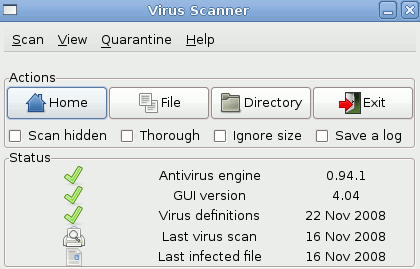 Clamav(clam antivirus) is an application program designed to be an antivirus toolkit for Unix and Linux based operating systems like Ubuntu 10.04 or 10.10.Clamav is an command line tool which is based on libclamav6 library.Clamav is a very flexible and feature rich(multi-threading daemon for automatic update of clam-freshclam package,a virus database for clamav) software and you can make it more efficient by installing clam TK ,the front end of Clamav.So when you will install clam tk then you will be able to work in graphical environment instead of command line.Other features includes built in support for archive formats,mail file formats,other most widely used document formats like PDF,files like HTML,RTF. 1. Open Synaptic Package Manager(from System->Administration->SPM) and enter your login password if needed. 2. Then,go to quick search bar(near top center) and type “clamav”. 3. Next,mark the boxes in the rows containing clamav and clam-TK(GUI fron end of clamav) and don’t forget to select all the additional library or packages when it ask(click OK) just after marking a box. 4. Now click on Apply and wait until the installation is complete.Later you can access it from accessories. 5. That’s all..I hope you have installed clamav successfully on your ubuntu-computer.